During the last year, the global petroleum coke (petcoke) market was buffeted by declining energy prices, changing ocean freight market, various delays, burgeoning petroleum coke production in the Middle East, and environmental issues. Furthermore, virtually all of the petcoke produced by Caribbean2 cokers is exported. The US and Caribbean producers account for 90% of the fuel-grade petcoke that is involved in seaborne trade, because petcoke produced in other parts of the world (e.g., Europe, India) is almost always used domestically. In addition to these fuel-grade petroleum coke exports, about 60% of the US calcined petroleum coke production is typically exported. Freight costs comprise a higher proportion of delivered petcoke cost versus that for most other traded commodities. The Canadian petcoke market is a good illustration of how cheaper seaborne freight can determine trade flows. Eastern Canada is a net petcoke importer, with the vast majority of this imported petcoke coming from the United States. Meanwhile, western Canada produces enormous quantities of petcoke from the tar sands in Alberta and Saskatchewan. Despite the domestic Canadian demand, it is much less expensive to ransport petcoke from Alberta and Saskatchewan to Asian petcoke consumers than to move this petcoke across the North American continent by rail to customers in eastern Canada. Petcoke is produced as a by- product in many — though not a majority of — oil refineries. Crude oil is first processed in an atmospheric distillation unit, followed by a vacuum distillation unit. The heavy residuum exiting the bottom of the vacuum tower (i.e., vacuum tower bottoms, or VTB) can be used to make asphalt, blended with some light products such as diesel to produce residual fuel oil (RFO), or used as coker feed (see Simplified Coking Refinery Flow Diagram above). Traditionally, cokers are installed in oil refineries to convert VTB and other heavy residual oils into higher-value light transportation products (e.g., gasoline, jet fuel, and diesel fuel). Until recently, a coker almost invariably increased refinery profitability because the yield of high-value transportation fuels is maximized and production of low-value RFO is minimized. While the coking process has been in use since the 1930s, petcoke production has seen its largest growth following 1990 because worldwide light transportation petroleum product demand has grown faster than RFO demand. Cokers have been and continue to be the preferred refining technology that allows the refining industry to reduce its production of RFO per barrel of crude oil processed, and bridge the gap between light product and RFO demand growth. Ultra-heavy crude oil production: cokers are used in upgraders that produce various grades of synthetic crude oil (SCO) from bitumen or ultra-heavy crude oils. This type of upgrader exists in Venezuela where ultra-heavy Orinoco Belt crude oil is upgraded and exported as lighter crude oils, and in Canada where upgraders are used to produce SCO from the bitumen derived from Alberta oil sands. There are two general applications for petcoke: as a carbon source and as a heat source. The former requires better quality (e.g., low sulphur and metals) and commands higher prices. Green petcoke3 is usually upgraded by calcination (a process which removes moisture and volatile matter and improves critical physical properties) when it is used as a carbon source. Petcoke that has been calcined is referred to as calcined petcoke (CPC). The largest market for CPC is in the production of anodes for aluminium smelting; other uses for CPC are in the production of carbon electrodes for electric arc furnaces, titanium dioxide ( TiO2) production, and as a recarburizer in the steel industry. About 25% of the petcoke produced is sold into these higher value-added markets for higher-quality petcoke; the remainder of the petcoke is sold into the fuel market, where it almost always competes with coal. Probably the biggest energy industry event in 2014 was the collapse of oil prices during late 2014/early 2015 (see Energy Prices chart, above). The oil price collapse was preceded by a build-up of crude inventories and the announcement that OPEC (Organization of Petroleum Exporting Countries) was not going to reduce production. Various officials stated that one of OPEC’s goals in maintaining production was to protect market share against rising shale oil production. US crude oil production increased from 5.0 million barrels/day in 2008 to 8.6 million barrels/day in 2014, all of it driven by the increase in shale oil (also known as tight light oil, or TLO) from less than 0.3 million barrels/day in 2008 to 4.2 million barrels/day in 2014. US oil producers reacted quickly to the steep decline in oil prices by cutting capital investment budgets for exploration and production, and the number of operating drill rigs dropped sharply. Going forward, the EIA projects that US TLO production will increase by 14% in 2015 but will then slow to an average annual growth rate of 3% for 2016‒2020. TLO produces very little VTBs, reducing the amount of material to be processed through the coker. Through 2012, as new shale oil production displaced light-sweet crude oil imports, the impact of increased shale oil production on US petcoke production was minimal. This is because the light-sweet crude imports also produced little VTB. However, as TLO production continued to increase, it began to displace imports of heavier crude oils, which in turn reduced the yield of VTB and thus petcoke production at some refineries. While US TLO production increased 37% in 2014, US petroleum coke production only decreased by 1%. A number of factors such as TLO being preferentially used by non-coking refineries, ramping up of production at recently completed coking capacity additions, and increased flow of heavy Alberta crude oil into the US Gulf Coast helped offset the impact of much higher TLO production on petcoke production. Beyond 2015, US petcoke production is unlikely to be affected by increasing TLO production, assuming the EIA’s projections of 3% average annual growth rate are correct. The Energy Prices chart above illustrates that declining crude oil prices had little discernible impact on either international steam (thermal) coal prices or petroleum coke prices. This chart might make one think that coal and petroleum coke prices are closely correlated. While there is an apparent correlation between steam coal cost and the price of petroleum coke, petcoke prices do not move in lockstep with coal prices. Petcoke is not fungible with coal due to its higher sulphur content, inferior combustion characteristics4, different ash characteristics, and various peculiarities of environmental regulations/permits. If petcoke prices were entirely determined by coal prices, then the value ($/MMBtu basis) of petcoke compared to coal would be constant (i.e., a straight line); however, this is not the case (see ≥6% Sulphur USGC Petroleum Coke vs. Coal graph). The ≥6% Sulphur USGC Petroleum Coke vs. Coal graph illustrates that freight cost is a critical element in the petroleum coke market. There is insufficient demand in traditional European, Mediterranean, and Latin American markets to utilize all US Gulf Coast (USGC) ≥ 6.0% sulphur petroleum coke, so this petcoke is forced to find outlets in Asia (principally China and/or India). Therefore, ≥6.0% sulphur petcoke pricing FOB (free on board) vessel USGC is determined by the delivered cost of this petcoke versus coal into Asia. Freight cost to transport USGC petcoke to Asian markets is much higher than to traditional European, Mediterranean, and Latin American markets because the transport distances are so much greater (see Petroleum Coke Freight Rates Graph). The longer transit distance from the USGC to Asia puts USGC petcoke at a disadvantage versus coal. For instance, the voyage of petcoke from Houston,Texas, to the west coast of India is over 11,000 nautical miles and 28 days. This compares to a 4,400-nautical- mile/11-day voyage for a vessel from Richards Bay Coal Terminal, South Africa, to the same destination. Thus, the delivered cost of USGC ≥ 6.0% sulphur petcoke as percentage of delivered cost of coal is lower into USGC petcoke markets (e.g., Mediterranean) than to Asia. In general, ocean freight rates during 2014 and 2015 have been relatively low by historical standards (see Petroleum Coke Freight Rates Graph). As discussed above, this is especially important in Asian markets. Until recently, the predominant petcoke shipment in the market was a 50,000–55,000-tonne cargo carried in Panamax sized vessels. This cargo size was determined by a number of factors including draught at the loading facility, loading terminal storage/segregation capacity, and terminal/facility limitations at the discharge port. For this reason, many USGC petroleum coke loading terminals were designed to accommodate Panamax sized vessels. Recently, the Panamax vessel classification has crept up to include 70,000+ dwt vessels. Shippers, striving to shave their freight costs, are tempted to charter these larger Panamax vessels, but many USGC petcoke terminals cannot fully load these larger Panamax vessels, typically due to draught limitations. In an effort to further reduce freight costs, during 2014 petcoke marketers sought to capture significant freight savings by shipping petroleum coke to India in 70,000+ dwt Panamax vessels versus smaller Supramax vessels. Since most Texas Gulf Coast petroleum coke terminals are draught-limited to approximately 40ft (12m), shippers found it advantageous to two-port load the Panamax vessels in the Texas Gulf Coast and then ‘top-off’ these vessels at deeper-draught Mississippi River terminals located near New Orleans, Louisiana. This required careful co-ordination to secure the appropriate cargo from suppliers at the various load ports. This year the savings in the ocean freight rates for Panamax versus Supramax to India decreased to the point that the incremental costs of loading at two ports often outweighed the freight savings. Under ongoing pressure to reduce freight costs, petcoke marketers have been pursuing loading baby Capesize vessels (i.e. 110,000–120,000dwt) at Mississippi River locations for Asian destinations. However, these efforts have been hampered by the fact that most USGC petcoke production is located in western Louisiana and Texas, with draught-limited terminals. Recently, one petcoke reseller loaded a baby Cape vessel with petcoke at a Houston area petroleum coke and coal terminal that had been modified to accept larger vessels. Over the past year, several construction projects and other initiatives have not come about as anticipated, contributing to uncertainty in the petcoke market. Among the anticipated changes in the market were the start-ups of new coking units in Brazil and Colombia, the start-up of a huge gasification plant in India, and the shift from fuel oil to petroleum coke to fuel Egypt’s cement industry. On the production side, the new delayed coking units in Brazil and Colombia were delayed in starting up. In Brazil, start- up of Petrobras’ new Abreu e Lima (RNEST) refinery located near Pernambuco, Brazil, has been delayed. As of the end of last year, only one-half of the refinery had started up, and the prospects for completing construction of the remaining capacity remain questionable. As a result, only one-half of the expected petroleum coke from this refinery is going to be entering the market. Additionally, ramp up of production of the completed coking unit has been slow, with less than 50% of petcoke production capacity reaching the market this year. The other delayed coking unit that has been delayed is at REFICAR’s expanded Cartagena refinery. This expansion project (which includes a new coking unit, initially scheduled to start up in 2013), was widely expected to begin production this May. However, recent indications are that this coker will start up in the fourth quarter of 2015. On the demand side, there has been some speculation regarding the start-up of Reliance Industries’ huge coal/petcoke gasification project. Initially it was expected to begin operations in 2015. Although Reliance subsequently announced that the first of the five modules would start up in March 2016, indications are that the start-up date will likely slip to late second quarter, with each succeeding module following every three months. When operational, this project will have the capacity to consume 30,000 tonnes per day of coal and/or petcoke. Lastly, the Egyptian government passed legislation in 2014 allowing certain industries to burn coal and/or petcoke in lieu of more expensive fuel oil. The shift to petroleum coke has been much slower than many in the petroleum coke market had anticipated due to operational and regulatory issues on a plant-by-plant basis. Additionally, since the bulk of fuel savings are achieved by switching from fuel oil to coal, some operators are prioritizing switching to coal as quickly as possible, with possible switching to petroleum coke to follow at some later date. SATORP and YASREF: these new refineries are located in Saudi Arabia. SATORP (a joint venture between Saudi Aramco and Total) is located on the eastern coast near the port of Jubail and YASREF (a joint venture between Saudi Aramco and Sinopec) is located at Yanbu on the Red Sea. SATORP began shipping petcoke in late 2014, while YASREF began shipping earlier this year. Each of these refineries is estimated to produce 2.2mt per year of fuel-grade petcoke, and is ideally located to supply the Indian and Egyptian markets. SOHAR: located in Oman, on the Persian Gulf, this new refinery is scheduled to start up in 2016 and it is estimated that it will produce ~0.5mt per year of fuel-grade petcoke. The Sohar Refinery is also strategically located to supply the Indian and Egyptian markets. RUWAIS: this new refinery is located in the United Arab Emirates, on the Persian Gulf, and is expected to start up later this year. The coking complex in this new refinery includes a petcoke calciner; it is estimated that the calciner will produce ~0.4mt per year of CPC. This refinery is conveniently located to supply the growing regional CPC market. Recent environmental issues surrounding transporting petcoke have had a significant impact on the petcoke market. The highest profile of these issues has involved three petroleum coke and/or coal terminals located in the southeast side of Chicago, Illinois. These terminals received coal and petcoke by barge, rail, or truck; provided storage space; and transloaded material to Great Lakes vessels or barges. Barges loaded at these terminals could access the US Mississippi River system through a series of canals and tributary rivers. Significant quantities of petroleum coke loaded into barges at these terminals moved downriver to the New Orleans area for transloading to oceangoing vessels. These Chicago area petcoke terminals have been embroiled in controversy regarding fugitive petcoke emissions since the fall of 2013, when the Chicago Tribune and other Chicago media outlets began covering complaints of southeast Chicago residents regarding fugitive petcoke dust emissions from open petcoke piles and during transloading operations. In March 2014, the City of Chicago Health Department issued a series of rules that significantly restricted petcoke and coal terminal operations and required storage areas be enclosed by June 2016. Much of the controversy focused on petcoke produced by BP’s Whiting, Indiana, refinery that was shuttled by mini-unit trains to either of the two Chicago terminals owned by Koch Industries. In February, BP announced that it was going to halt use of Chicago area petcoke terminals by the summer of 2015, and is implementing these plans. As of the end of June, two of the Chicago area coal and petroleum coke terminals, Beemsterboer and KCBX North, are closed; the third terminal, KCBX South, continues to operate. the marine loading facilities at Jubail rather than moving it by truck. However, when the refinery started up in the fourth quarter of 2013, the conveyor system was plagued with problems, limiting the flow of petcoke from the refinery. It was not until June of this year that, via trucking and restricted conveyor operations, sufficient petcoke could be moved to the terminal to keep up with refinery production (about four vessels of petroleum coke per month). This conveyor/truck operation will likely continue until the conveyor system is fully operational. In the last year, China’s interest in high-sulphur petroleum coke has dramatically declined as Chinese authorities are pushing for petcoke importers to avoid importing high-sulphur petroleum coke. Perhaps potentially the largest regulatory impact on petroleum coke, MARPOL VI, looms on the horizon. If MARPOL VI is not changed, vessel operators will have to use fuel oil that does not exceed 0.5% sulphur or install SO2 seawater scrubbers by 2020. If significant numbers of ships are not retrofitted with SO2 scrubbers, then demand for high-sulphur marine fuel oil will decline significantly. In response to declining high-sulphur fuel oil demand, some refiners will likely choose to install coking units, potentially providing a flood of additional petcoke production for the petcoke market to absorb. Petroleum coke has been buffeted by a series of events in the past year. Perhaps the most significant development is increased scrutiny of petcoke terminal and transport operations by environmental activists and regulators. While small compared to many other dry bulk or energy commodities, the petcoke market will continue to provide business opportunities for those that can evolve and change in response to various market and governmental forces. 1. Brazil, Canada, China, Egypt, Indonesia, India, Italy, Kuwait, Mexico, Saudi Arabia, Spain, Syria, United States, and Venezuela. 2. Hovensa St. Croix (US Virgin Islands),Valero Aruba, and six coking facilities inVenezuela.With the shutdown of Hovensa St. Croix and Valero Aruba in 2011, all current petcoke production is located in Venezuela. 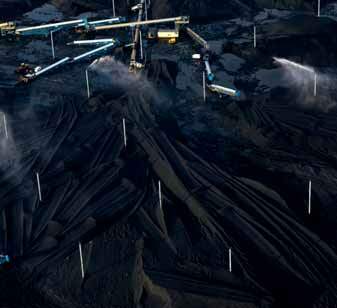 3.Technically, all petcoke is ‘green’ when it is produced because all petcoke that has not been calcined is ‘green’. However, in the petcoke industry the term green petcoke (GPC) typically refers to higher-quality petcoke used as calciner feedstock. 4.While petroleum coke has higher heating value and lower ash content than coal, it has very low volatile matter content which causes flame stability problems. Additionally, petcoke macerals are much less reactive than coal macerals, so it is much more difficult to completely combust petroleum coke than coal. Petroleum coke is often more difficult to pulverize than coal (i.e. lower HGI). Contributing editor to Jacobs Consultancy’s Pace Petroleum Coke Quarterly©. He has an in-depth background in the power sector, including experience in procurement, operations, environmental compliance, and engineering. He leads Jacobs Consultancy’s fuel-grade petcoke practices and has been the project manager for numerous studies involving the fuel-grade petcoke market, environmental issues, and power generation. Pace Petroleum Coke Quarterly and is involved with single-client studies of the global fuel-grade and anode-grade petcoke markets. Prior to joining Jacobs, he was a Petcoke Marketing Manager for ExxonMobil. Jacobs Consultancy Inc. has published the Pace Petroleum Coke Quarterly© (PCQ) since 1983. The PCQ has been published monthly since 1984 and is considered the worldwide authoritative source for petroleum coke market information.